I met Kelly King, Procurement Officer, Habitat for Humanity Victoria in mid-June at a business meeting. Habitat invited thirty local artists and designers to participate in a special event, Take A Seat for Habitat Campaign, to celebrate the Grand Opening week of their new location this August. Kelly asked if I would participate. 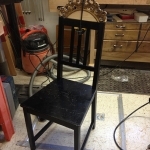 The idea is to take a simple wooden chair (provided by Habitat) and paint, transform, up cycle, revision it using only your imagination to guide or limit you! 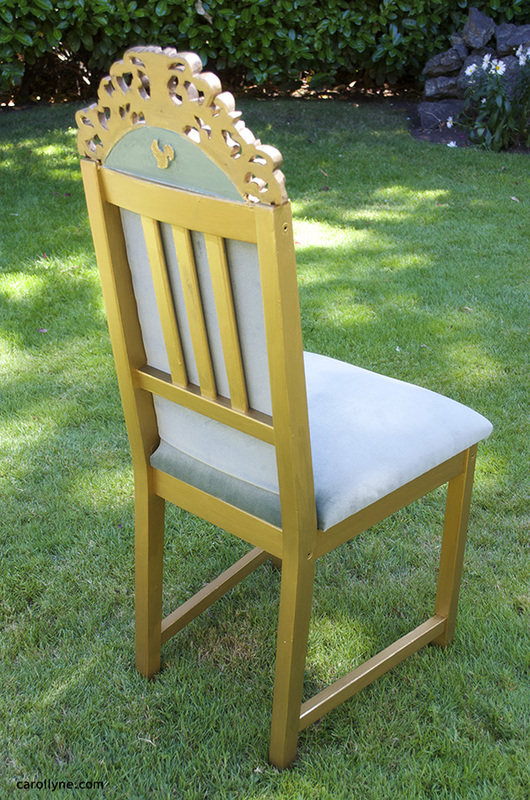 All chairs will be available for silent auction at their new ReStore (3311H Oak Street) during the Grand Opening week (Saturday, August 15th. Festivities begin at 10 am) and 100% of the money raised goes toward their current build at 4000 Cedar Hill X Road. Habitat for Humanity Victoria is a registered charity whose mission is to mobilize volunteers and community partners in building affordable housing and promoting homeownership as a means to breaking the cycle of poverty. 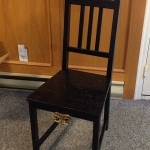 Update: Chairs will be available for viewing and silent auction from Saturday, August 15 to Saturday, August 22, with an option to fill out a Pre-authorization Bid Form if you can’t make it back to raise your bid. 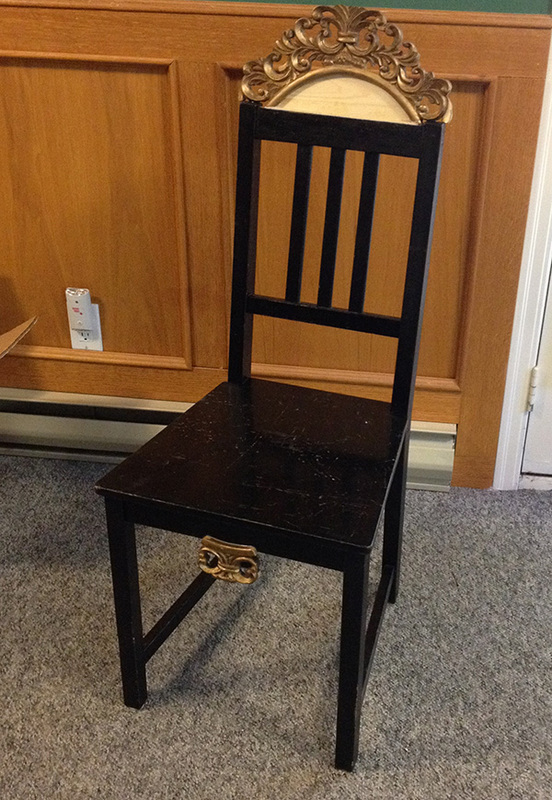 Kelly delivered a plain wooden IKEA chair to my studio. 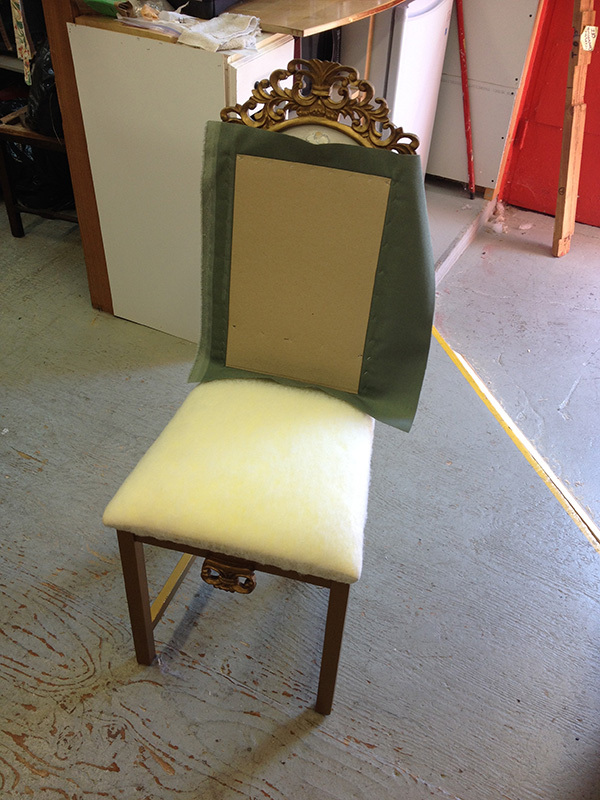 It had been one of thirty restaurant chairs donated to the ReStore. 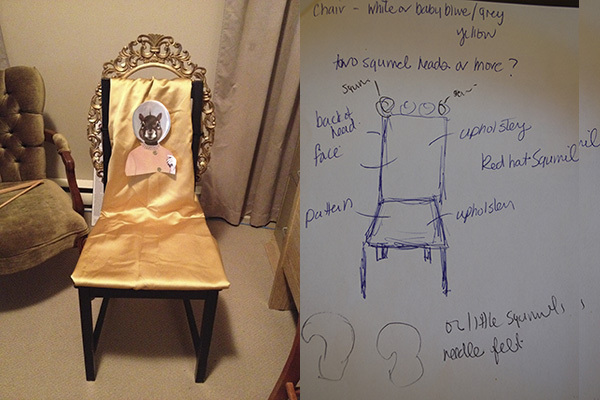 I mocked up the initial design by draping a gold vintage evening gown over the chair, and pasting an image of Space Hat Squirrel to the upper seat. 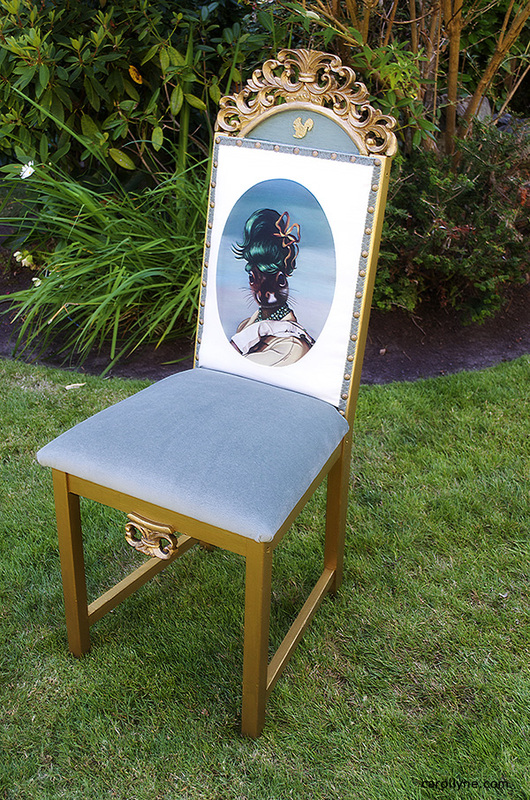 I wanted to change the shape of the chair somehow, and have it mimic a framed painting. I knew I had just the frame in my stock room; a delicate, hand-carved, wooden oval frame. 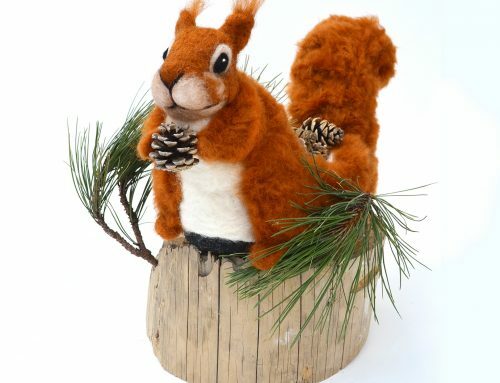 I also tried mock ups with images of Red Hat, and Green Bun Squirrel (with a green vintage evening gown). 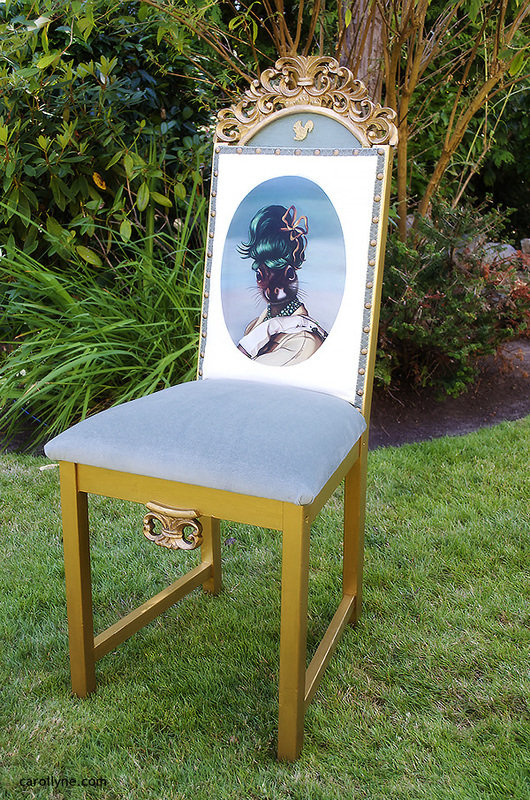 Knowing I was going to paint the chair gold to blend in with the frame, the image and colour scheme of Green Bun Squirrel became the ultimate choice. 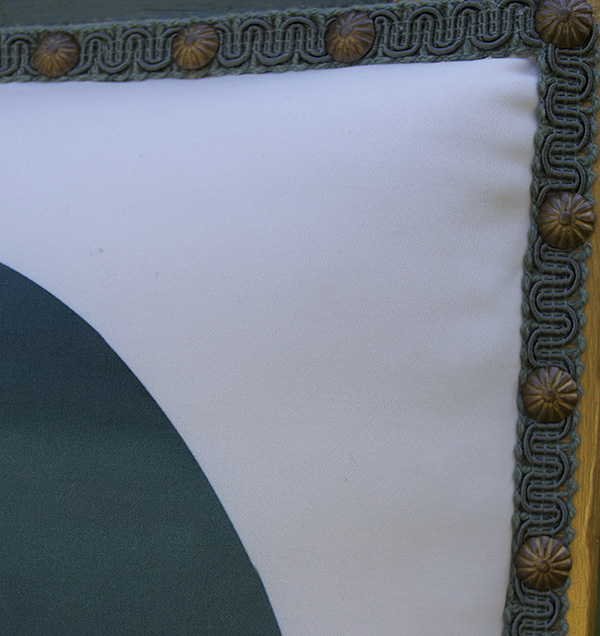 I then had the image of Green Bun Squirrel printed on a cotton sateen fabric made by Fabric on Demand. It arrived, as anticipated, within 10 days of ordering. Next up, was enlisting the help of two very special people. 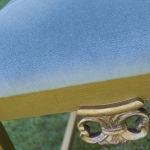 I needed two experts; one in wood turning and the second in upholstery – with the tools and know-how, to help make my vision a reality. 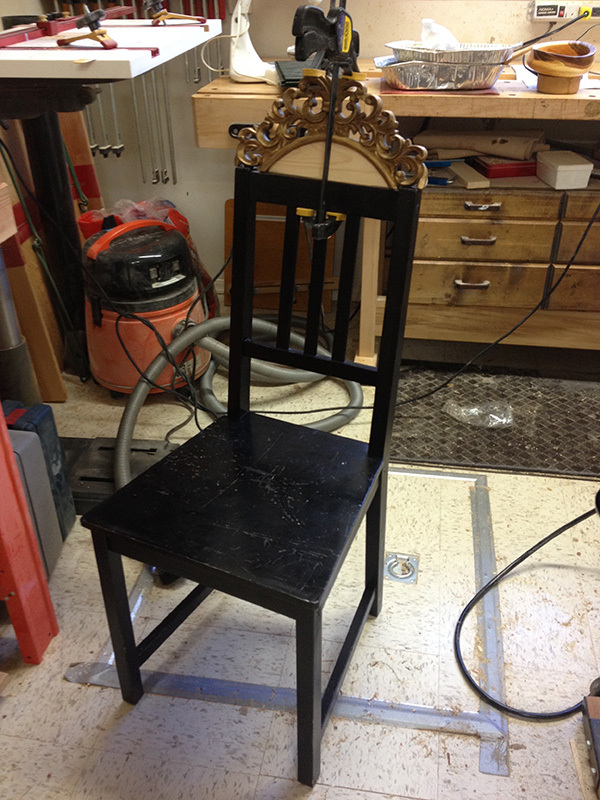 First, I needed the gold, oval, wood frame cut and securely added to the top of the chair. My good friend Steve Werner has a fully equipped wood turning studio. 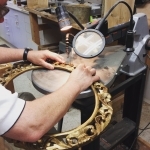 In the past, Steve has helped me cut several wood boards to fit custom-sized, oval, vintage frames. He also happens to create beautiful bowls, pepper mills, and is the creator of the ultimate Steve Werner Pen (bespoke and posh). I am very lucky. 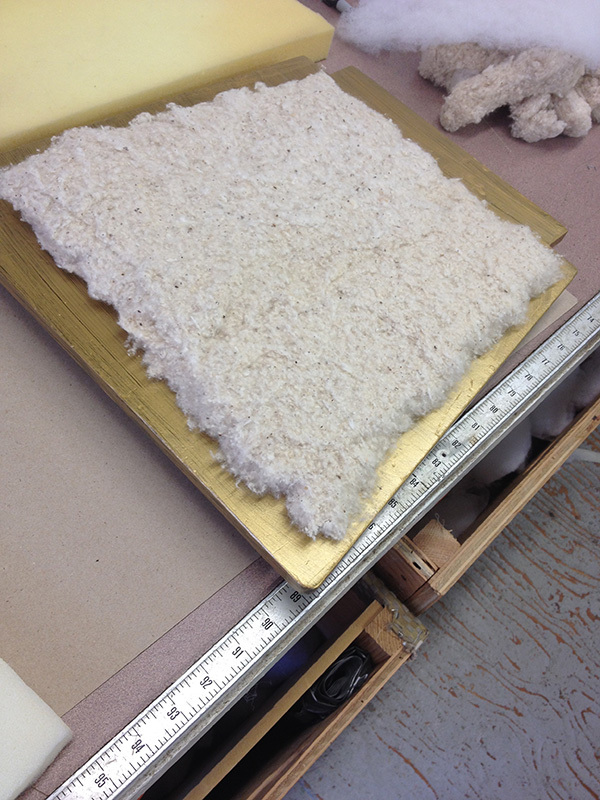 Steve was willing once again, to help me overcome my fabrication challenges. 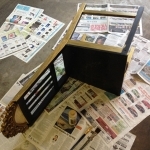 Steve chiselled out pieces of gold frame that would serve as the embellishments for the top and base of the chair. 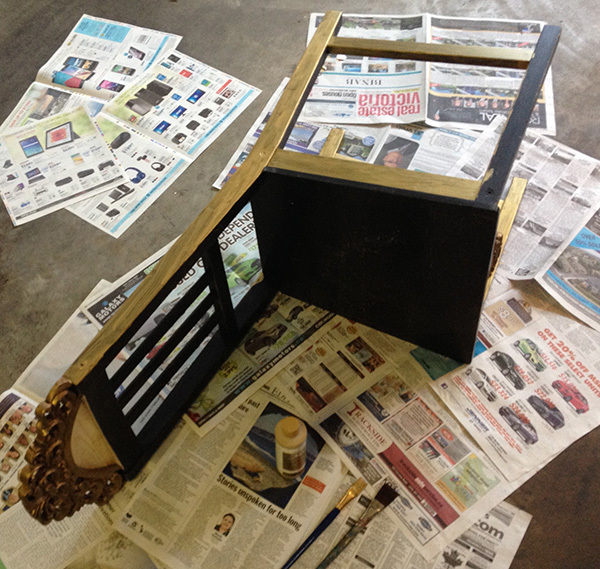 He then secured the gold frame pieces with dowels, and super glue/resin epoxy, to make sure it was built to last. 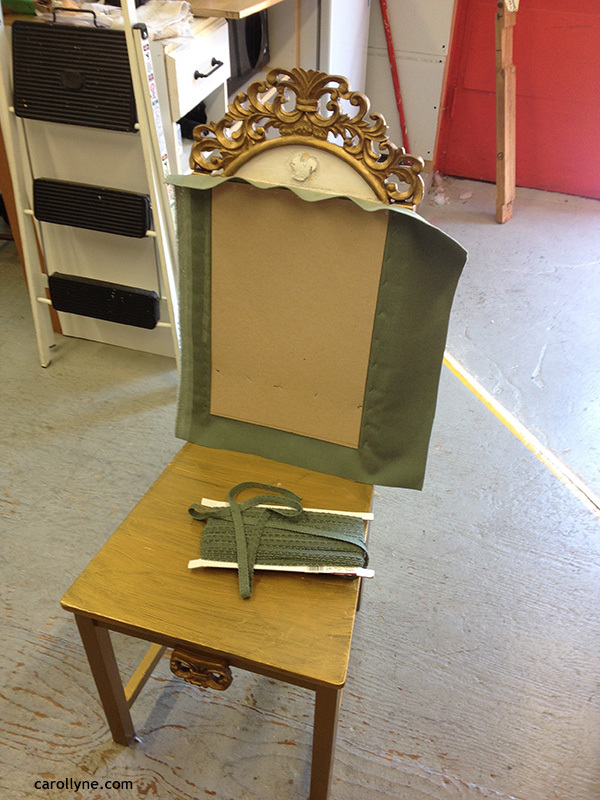 This was the first miracle in creating the magnificent Green Bun Writing Desk Chair. 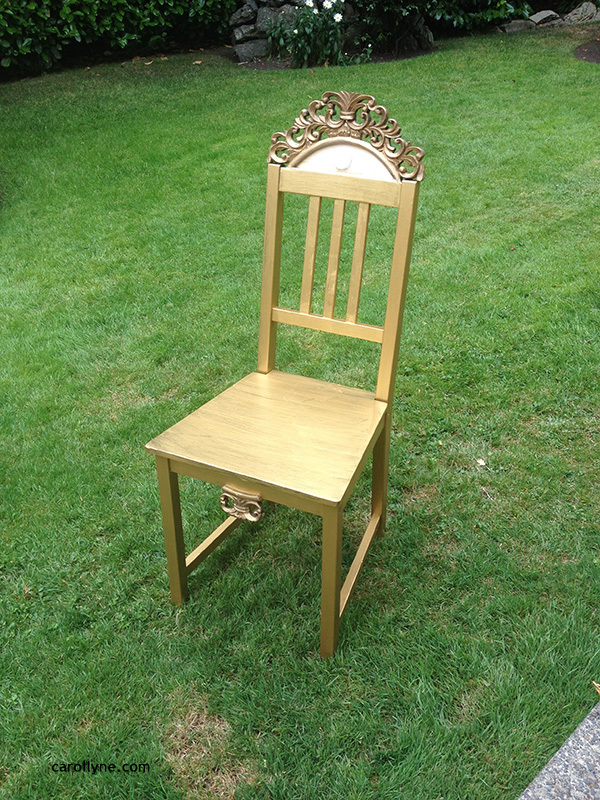 Afterward, I brought the chair home and painted it gold (after several trips to home hardware stores, I found the gold paint at Michaels). 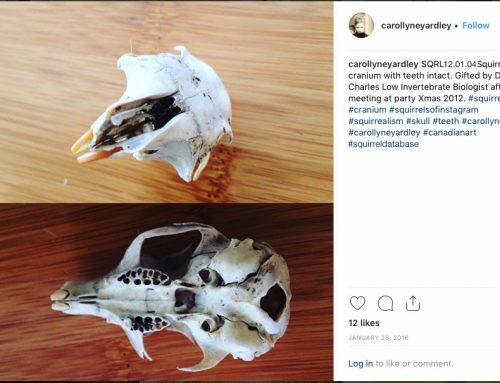 Later on, I moulded two little squirrels out of moulding paste (by Golden), and secured them to the front and back half moon area, at the top of the chair (painted turquoise green). 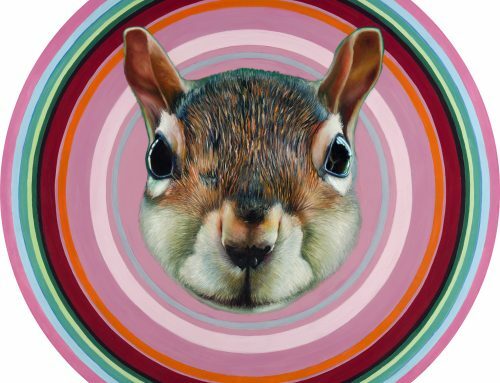 Each squirrel was then painted gold in colour. Next up, is a story of one of life’s serendipities. 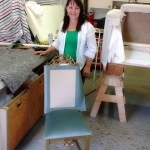 Concurrently to this project, I was getting an antique chair reupholstered at Crystal Upholstery, and met Ruth Warkentin. 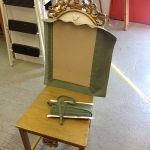 I told Ruth about the ReStore project, and showed her the plain wooden chair, asking, “How would I upholster something like this?” Well, I was asking the right person. Not only did Ruth know about the project (she was also re-imagining a chair for the Habitat auction), but she suggested I come to the store during her day off to “play.” Ruth also let me know that Crystal Upholstery was willing to donate the supplies, tools, and lush green velvet (she gave me a selection to choose from) for the bottom seat. 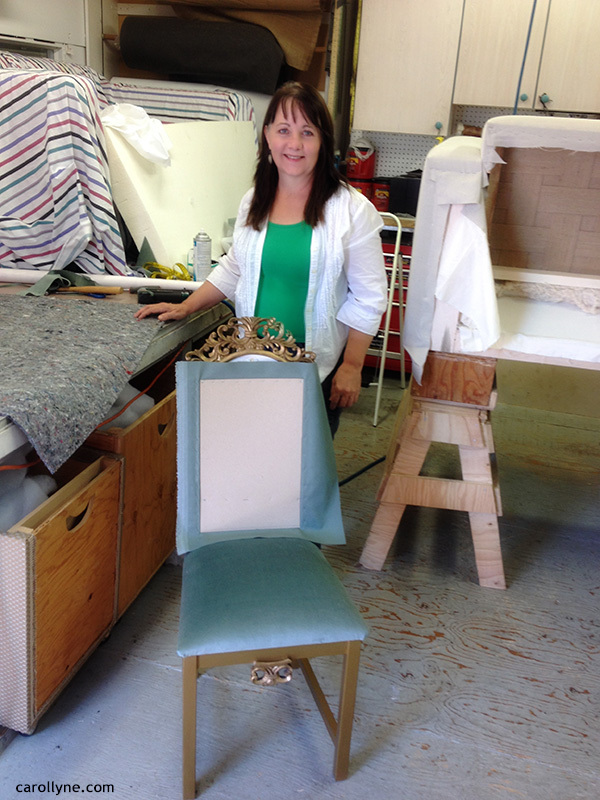 Once I arrived, Ruth led me through some options, and then proceeded to teach me how to upholster the chair, step by step. Her many years as an educator at VIU (formerly Malaspina University College) was apparent. 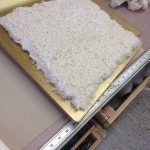 An artist, and natural teacher, Ruth helped me understand exactly how fabric is folded, wrapped and secured. 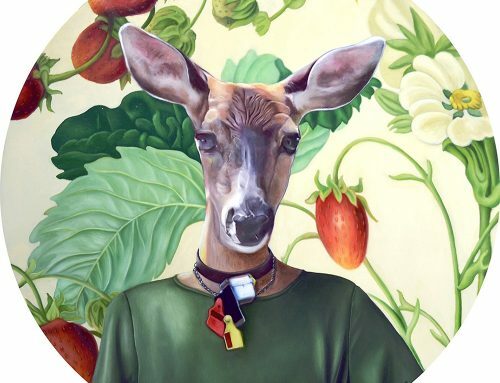 She also helped open my mind to possibilities of what’s possible with working in this medium. 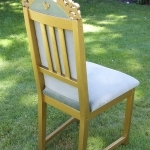 Imagine a full set of 12 dining room chairs! 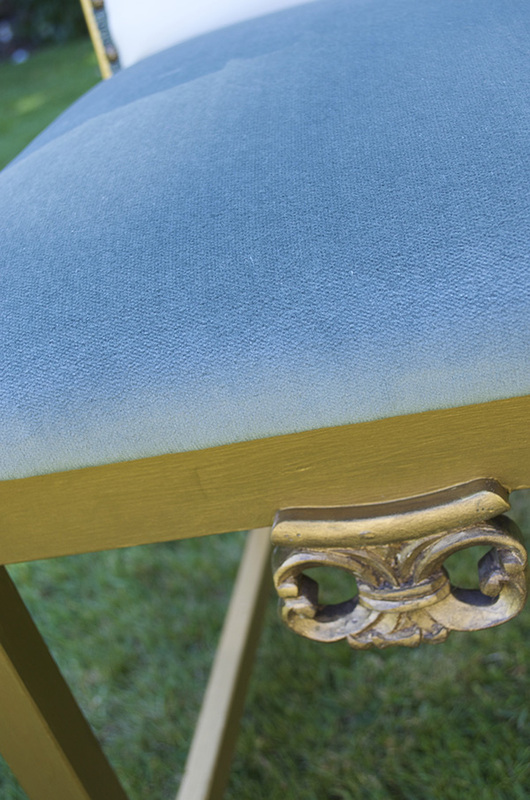 The final piece was to apply the cotton sateen, and velvet fabric with a non-toxic, non-allergic protection formula for permanent stain and sun fading protection. 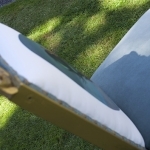 My good friends at Green Way Carpet Cleaning applied MicroSeal to the chair to help keep it looking it’s best for many years. Many thanks to both Ruth and Steve for their time, and help. I am most grateful. Rob and Lori at Greenway Carpet for their generous contribution of MicroSeal. 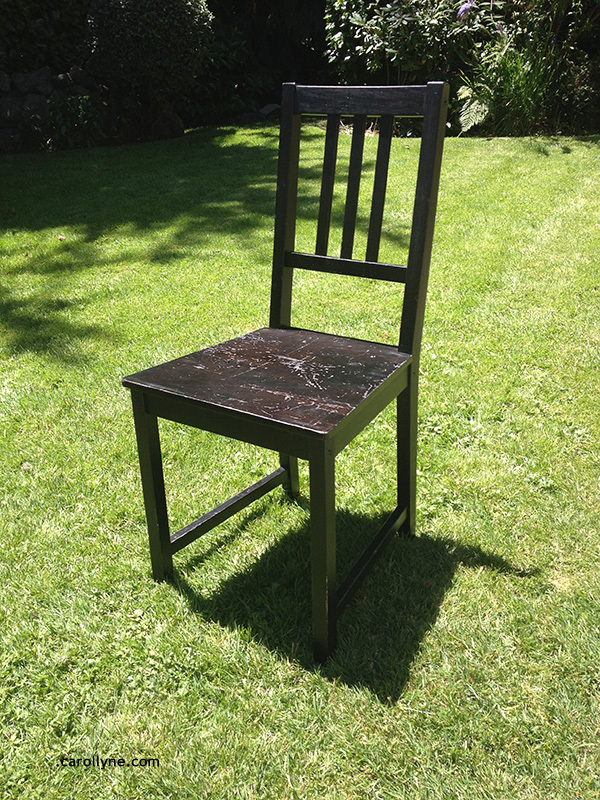 The finished piece is a lovely, signed, hand-crafted-with-love, writing desk chair. 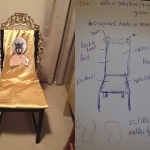 I hope the winning bidder loves the chair as much as I do. For more information about Habitat for Humanity and the ReStore follow this link. 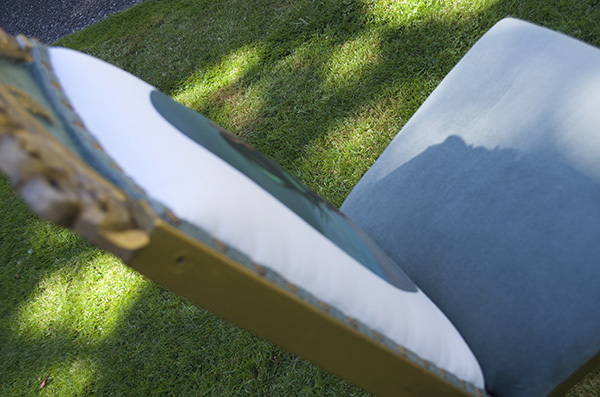 Photo Gallery: Phases of the chair production. 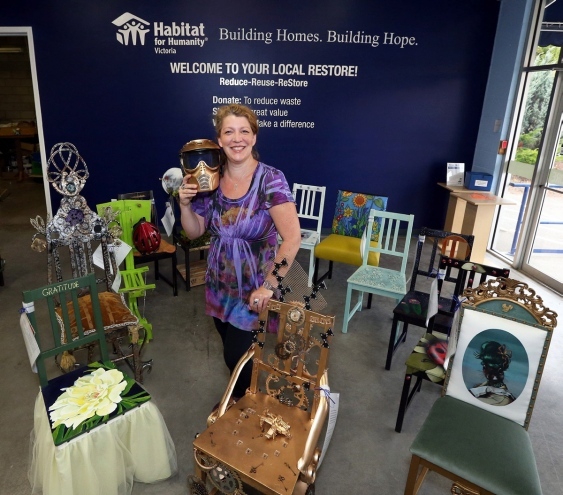 A wild collection of decorated chairs that range from comfy to creative, and touching every base in between, will be front and centre when Habitat for Humanity opens the doors to its second ReStore retail location today. 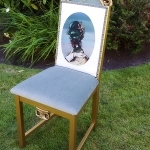 The chairs decorated in wild and wacky fashion by 30 Island artists are part of a fundraising project called Take a Seat for Habitat that hopes to raise money, through a silent auction, for the cause of building homes for lower-income working families. 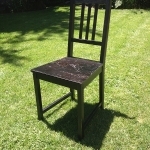 “I walked in and saw 30 identical plain wooden chairs and thought ‘instead of just selling them, why not create some excitement and interest and show people what they could do with a plain wooden chair,’ ” said Yolanda Meijer, executive director of Habitat Victoria. 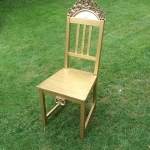 So 30 artists were contacted, given a chair and had about six weeks to create something that will be auctioned off over the next week. 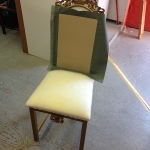 In order to bid on a chair, people have to come to the new ReStore at 3311 Oak St., but they can arrange to have ReStore staff bid on their behalf up to a certain level. Meijer said she’s not sure how much they will raise with the program, but she stressed that the idea transcends raising money. 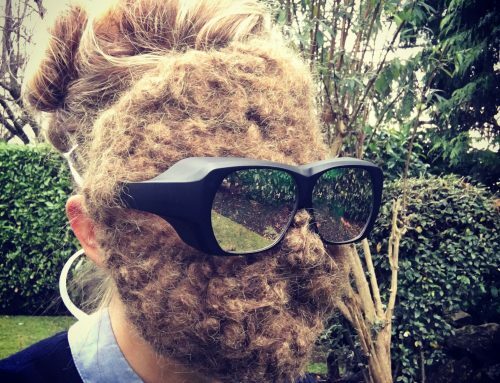 “We wanted artists to be more aware of the ReStore because we get such unusual objects in here, so this was to engage a different demographic,” she said. It’s also about inspiring existing customers to imagine what they could do. Habitat has had its new location since early June and has renovated and amassed inventory for the shelves. Its ReStore outlets sell quality new and used home improvement items and building supplies from lighting, flooring and furniture to major appliances and antiques. The 8,200-square-foot store will also help the organization tap into a massive market that it isn’t reaching. Habitat Victoria first opened a ReStore on Douglas Street in 2004, but moved to Langford in 2009 when it purchased a 12,000-square-foot building. Meijer noted that while the Langford location is likely to do $850,000 in sales this year, few customers moved to the West Shore with them, as a recent study showed more than 85 per cent of those who donated or bought from the Langford ReStore lived in the Western Communities. “The other store is hitting its sweet spot and we realized we weren’t tapping into the households in a five-kilometre radius, so it made sense to establish a store here. This location will introduce us to the 100,000-plus people who have never seen it while reintroducing us to those who knew us from Douglas Street,” she said. With a soft opening this week, the new ReStore has had several people walking through every day, which Meijer expects to increase significantly when they start to advertise and get their signage up along Blanshard Street.